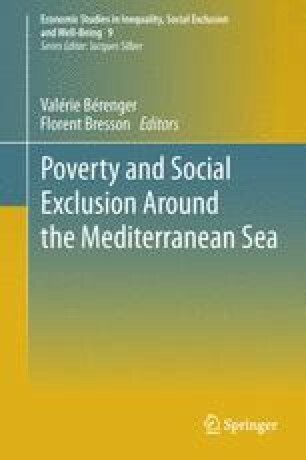 This chapter investigates the dynamics of poverty in Egypt using monetary and non-monetary panel data, and the impact of trade liberalization on poor and low waged workers. We find a relatively low level of economic mobility in both income and non-income indicators, with the majority of those who were “poor” in 1998, whether in the monetary or non-monetary dimension, remaining so by 2006. Trade reform in the form of lower tariffs and increased export promotion exerted a small positive influence on the incomes of the poor; however, this came at the expense of greater informalization of workers and higher incidence of low quality jobs. We also find that private sector employment and gender have a much more important role in segregating the labor market. We thank Ali Rashed and Randa Hamza for able research assistance and are grateful to Ragui Assaad, Valerie Bérenger, Florent Bresson and two anonymous referees for valuable comments and suggestions. The usual disclaimer applies. © Shireen AlAzzawi and Mona Said 2012.